Coffee purists everywhere are united in the belief that the French press system of coffee brewing, first developed in 1929, is the original and the best method, for making truly outstanding coffee. Some may disagree, but it definitely is one of the simpler ways. In this review will weigh up the pros and cons of the Sterling Pro French Press Coffee & Espresso Maker, valued against price, quality, style and overall usefulness. Why Choose The Sterling Pro? Here are some of the reasons that we think this Sterling Pro French Press is a worthy purchase for any coffee lover who is looking for a simpler way to make coffee or espresso at home and perhaps doesn’t feel the need to spend a lot of money on a giant electric espresso machine. The Sterling Pro has an elegant and attractive design with clean lines, in a smart metal holder and a chrome lid. Maybe you’ll find this with other French Press units as well, but the Sterling Pro is certainly one of the units that is aesthetically quite well made, with its own spin on the classic French Press design. Makes an excellent birthday or wedding present. Why? That’s because its a highly functional and fun way to brew coffee or espresso at home, not to mention that it doesn’t cost a whole lot. Brews 1 liter of coffee – or 8 coffee cups. When it comes to capacity, there are much smaller coffee brewing methods, although its true the Sterling Pro French Press is by no means the largest. That said, it makes a sufficient amount of coffee for oneself or a small party of people, and, since its quite aesthetically pleasing to look at, it is most often a welcome addition to any party that serves up coffee. 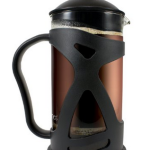 Made from heat-resistant, borosilicate glass, the overall quality of this Sterling Pro French Press is just about right for the asking price, which tends to be around $30 at the time of this review, with an extra plastic liner on the lid to prevent the lid from heating up too much. 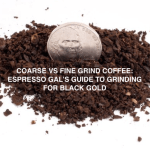 Also, because of its innovative double-screen system, you’ll get absolutely no grinds in your cup of coffee. Comes complete with two free replacement screens, in case they are worn out during the lifespan of the carafe. Its always nice to get a few little extras. Can be easily taken apart for cleaning purposes by hand, or you can safely put the Sterling Pro French Press in the dishwasher. The carafe can be replaced easily with another standard size carafe, should it break by accident. Great coffee anywhere you want to take it in the house! This coffee maker is not chained to the mains electricity-wise, like its automated cousins! This method really is simplicity itself, requiring no electricity, no mechanization and nothing except good old fashioned time and patience to brew the perfect cup. Choose how much coffee you want and how long you wish to brew it for, without any program deciding it for you. Can double up as a teapot, for loose tea leaves after a thorough clean, if you so wish. This is the key to keeping in all the flavor of the coffee bean. Instead of being only briefly introduced to the bean, the coffee is allowed to brew over a much longer period of time. 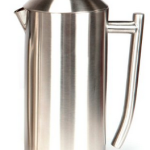 French Press coffee pots do not cost the earth and you can spend as much as you can afford on this item. Temperature control is key to the best brew of coffee. Decide for yourself at just what temperature you wish to introduce the hot water to your precious beans! Most advice is in the 185-200F range. No filters required, so most of the flavour ends up in the cup, not filtered out! Put simply, this method keeps more of the oil, in the coffee bean, within the water and more oil equals more flavor! Brew your own cold brew coffee, for a fraction of the price of expensive coffee houses! Cold brew coffee, or “toddy coffee”, is a coffee that has been brewed with cold water and left to steep at room temperature. It is not to be confused with an iced coffee, which is usually a hot coffee, that is then served over ice and left to cool. Although it may be used to form the basis of a superior iced coffee. To make cold brew coffee, coarse or roughly ground coffee beans are imperative and so a quality French Press like the Sterling Pro is a must. The coffee needs to be left to brew for a minimum of 12 hours (many people choose to do this overnight) but others leave it even longer, for 18 or even 24 hours! This coffee will be a lot sweeter and deeper in flavor, as the beans are not being scorched or degraded by hot water and therefore have a much lower acidity. As a result the flavor will be a lot more intense and there is also far more caffeine in a cup of cold brewed coffee! To conclude, the serious coffee buff needs a serious machine, preferably complete with shiny dials and knobs, that makes a loud whirring noise and comes with a suitably scary price tag? Well, not necessarily. Sometimes the best things in life, while not actually free, can be quite simple. This is a timeless, but elegant design, which looks pretty and will make a great cup of coffee with a minimum of fuss. With care, your SterlingPro should last many years and if any parts should wear out, they are quite easily replaced. In all, we score it 5 out of five stars for quality, cost, and style. The classy steel and chrome carafe adds a touch of sophistication to any table and does not cost a fortune. All it requires is a bit of patience and some waiting, for a truly sensational result!